The Flag shall be of the Lord Baltimore colors, to wit: black and gold, heraldically arranged as in his armorial bearings, that is to say, paly of six pieces, Or and Sable, a bend counterchanged; and superimposed thereon, as an augmentation of honor, a shield, Sable, bordered, or, charged with the Battle Monument argent, in memory of the Defenders of Baltimore during the War of 1812-14. In non-heraldic language, the field of the flag is divided into six equal vertical stripes, alternating from the hoist gold and black. From the top of the hoist to the bottom of the fly is a diagonal stripe (the same width as the vertical stripes) that reverses the colors, beginning with black. Overlaying the center is a heraldic shield with a black field bordered in gold. 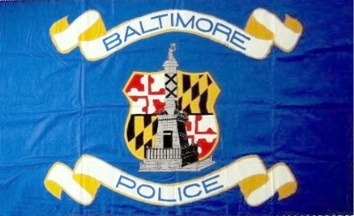 The center of the shield depicts Baltimore’s Battle Monument in white. The ordinance specifies that on a flag of 6 by 9 feet, the shield is two feet six inches wide by three feet and three-eighths of an inch high. The city was named for Lord Baltimore (George Calvert, the first English Baron of Baltimore, seated in County Longford, Ireland). His arms also appear on the first and fourth quarters of Maryland’s flag, and were the colors first brought ashore by the early settlers of the state in the 17th century. The Battle Monument, the central figure on the city’s seal, was designed by Maximilian Godefroy in 1815 to commemorate the successful defense of the city against the British in the War of 1812, the same attack that gave rise to the national anthem, The Star-Spangled Banner. Mayor James H. Preston appointed a flag commission on 10 July 1914 to develop a city flag design in cooperation with the municipal art commission, in time for the September 1914 centennial of the writing of The Star-Spangled Banner. The centennial committee offered a prize of $50, and 40 designs were submitted to the flag commission. However, finding none of them “entirely acceptable”, the commission itself “evolved and accepted” a suitable design. The flag commission, consisting of Judge Henry Stockbridge, Mr. Carroll Lucas, Mr. Wilbur F. Coyle, and Mrs. Hester Dorsey Richardson. The original design submitted by the flag commission also showed a green laurel wreath around the shield, perhaps because of concern whether it would be heraldically correct to place a black shield on a black field. Later someone wrote to the heraldic experts at the College of Arms in London to inquire about this matter. Keith W. Murray, Portcullis Pursuivant, replied that the flag was correct without the wreath because the field was “paly or and sable” (vertically divided yellow and black), so the “rule of tincture” was not violated. He did suggest changing the “inescutcheon” (shield) to “azure” (blue), but the all-black-and-gold design with the white monument won out, and the wreath was dropped. Two other designs had been submitted to the Municipal Flag Commission, and Pursuivant Murray pronounced them both heraldically correct. Clayton C. Hall proposed the flag should be; Azure, a representation of the Battle Monument Argent, on a canton the Calvert Arms. R. H. Spencer proposed: Paly of six Or and Sable, a bend counterchanged, and on a quarter Azure, the Battle Monument (Baltimore Sunday Sun, 16 May 1915). 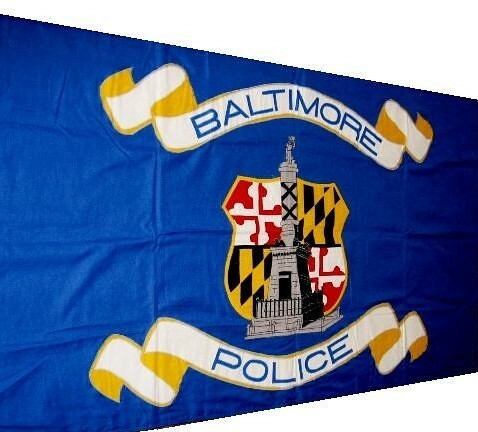 "From about the turn of the 20th century, Baltimore used a blue banner with the Battle Monument in white. One early version also included a wreath of green around the Battle Monument, perhaps the inspiration for the wreath suggested by the flag commission."